For most visitors to the country, Dili is the first stop, the jumpoff point to other East Timor places, largely because most of the hotels in the country are located here. Before you leave Dili, though, to visit the other parts of East Timor, take some time to explore the city’s own treasures and landmarks first. One of those is the Integration Monument, which depicts a man wearing East Timor’s traditional costume, pulling his hands apart to break a link of chains. Although at first glance, it is easy to interpret this statue as a symbol of East Timor’s struggle for freedom from all foreign rule, the fact that the monument was installed by the Indonesian government somewhat confounds things. In fact, the monument might have long been demolished by the East Timorese if it had not been standing on a pedestal 10 meters (33 feet) high. At the Xanana Reading Room, you can find documentaries and videos about East Timor. It may be a good idea for you to check these out and understand the country better before you head out on your trip. 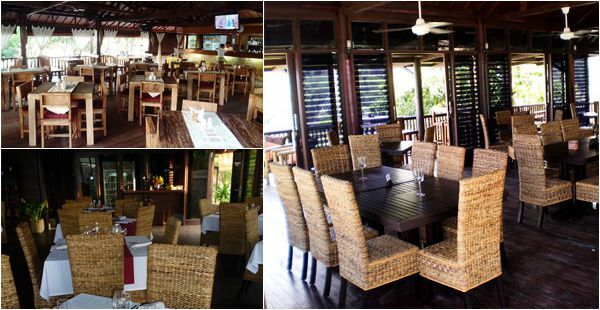 At the Ante Moris, you can get authentic Timorese paintings. One of the special features of the paintings here is that they are made not on ordinary canvass but on East Timor’s valuable traditional woven cloths called the tais. Named after the independence-movement leader Nino Konis Santana, who was born in a village found within the park’s boundaries, the Nino Konis Santana National Park is the first ever national park to be created in East Timor. The park covers 1,236 square kilometers (477 square miles) of land area. It also covers 556 square kilometers (215 square miles) of marine territory within the Coral Triangle, which is one of the areas with the greatest marine biodiversity in the world. The park was created to protect a number of threatened species, including the endangered Timor Imperial Pigeon, the Timor Green Pigeon, and the Yellow-crested Cockatoo. Other attractions in the park are the huge domesticated water buffaloes, the giant frog fish, the scorpion fish, the box fish, the crocodiles, the civet cat, and the cuscus. Eight hours away from Dili is the beautiful Jaco Island. Featuring wide stretches of pristine white sand, this beach is almost empty except for the fishermen and their boats. An interesting sight you might catch here is of snorkelers using spears to catch tuna. Although that is by far not an easy thing to do, it is made a bit easier by the fact that the water here is so clear, visibility is nearly unlimited. That’s a great thing because the amount of marine life to see here is astounding. But you don’t need to wait until you reach Jaco Island before the fun begins. In fact, the trip to Jaco Island is, in itself, an adventure. To reach the island, you first need to walk around 8 kilometers (5 miles) from Tutuala, because no 4×4 could make it through the available trail. And then, you need to get yourself a boat ride. This should not be hard, as there are fishermen all around who would be happy to bring you to the island and back again on their boats for a handful of dollars. They would also be happy to sell you some of their catch, and cook it for your lunch. On the way to Jaco Island, keep your eyes peeled for the dolphins that frequent the channel, looking to feast on the abundant fish living there. Once you get to the island, you will find that although it was no walk in the park to reach it, the effort was certainly worth it. Surely, there are few other places on earth that can match the beauty and tranquility of this little piece of paradise in the Southeast. 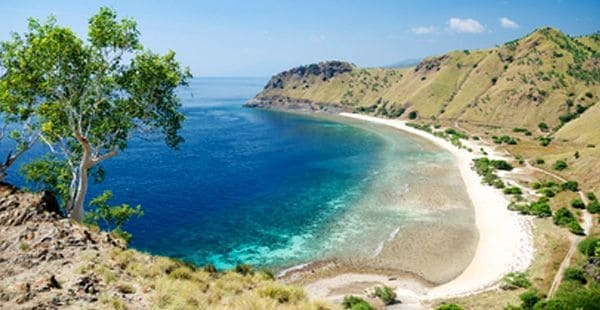 Twenty-five kilometers (16 miles) away from Dili is the small but ecologically rich island of Atauro, unquestionably one of the best diving sites in the country and even in the world. The whole 104-square-meter (1,119-square-foot) island is encircled with a coral reef that begins just 3 meters (10 feet) below the water surface and not far from shore. Unlike most diving sites in the world, many dive sites in East Timor are found very close to the beach. To top it all off, the visibility is excellent, reaching up to 40 meters (131 feet). Whether you decide to go scuba diving or snorkeling, you will surely come across a lot of interesting marine life. Whales, dolphins, even manatees are often seen here. You can reach Atauro Island with a three-hour ferry trip from the capital. Depending on your travel class, this can cost $2 to $10 per head, two-way. Mount Ramelau, also called Tatamailau, is a 2,964 meter (9,724 foot) mountain located around 70 kilometers (43 miles) from the south of Dili. It is East Timor’s highest mountain. 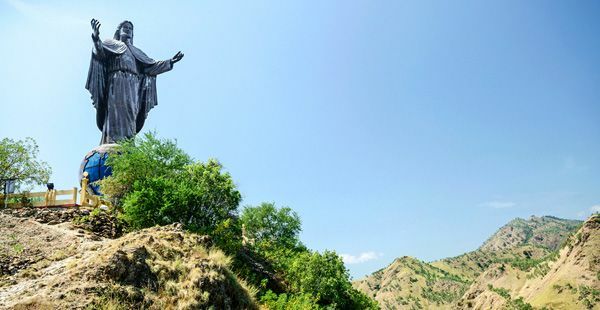 At the peak of the mount, you will find a 3 meter (10 foot) tall statue of the Blessed Virgin Mary. This makes the mountain a popular pilgrimage site for Catholics. From the town of Hato Bulico, you can find a path that leads from the foot of the mountain to the Virgin’s statue at the peak. But this pilgrimage to Mary is not the only spiritual significance the mountain has for the East Timorese. Despite East Timor’s being a Catholic country, its people retain many ancient animistic beliefs as well. One of their beliefs is that their ancestors’ spirits make their home in Mount Ramelau; so each year, on October 7, they go to the mountain for an overnight pilgrimage, to pray and to visit their ancestors.